I´m here today with my new layout featuring 7gypsies Architextures Collection. I made this layout for the current challenge at More than Worlds "Fearless & Grunge" (scroll down for the challenge board) that really appealed to me. I that things is not perfect so grungy - yes! And fearless is a word with many dimensions. Both good and bad. I picked the "Song Birds Sing" paper to work on. The back of the paper has a perfect grungy feel already and only needed a bit of enhancing to get the perfect look. I added more interest with paint and random stamping with black ink. Small details like the punchy flair and the stars from the Architextures Junk Pack "Cabin" add the right style touch. I love the piece from the Junk Pack that looks like an old distressed wallpaper - dirty and all - and I added it under the photo of my daughter. You must say I picked the right picture for this challenge. She looks both really grungy and she is fearless in a good way - and I do hope that she will continue growing up like that. Do you see the piece that looks like lace above and below? 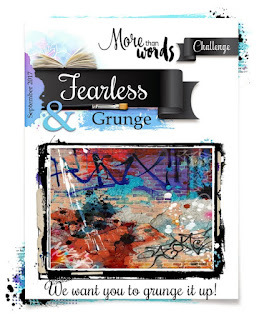 Well that is also a piece from Architextures Junk Pack "Grunge". It´s self adhesive and dimensional and best of all really flexible. Love it! This is wonderful! I love all your grungy bits'n'pieces, especially that lacy look product. Thanks for joining us at More Than Words. Oh, how I love this! Your photo is perfect for the word and challenge! Thank you for playing along with us at More Than Words! I love your page Marie! It's simply gorgeous! Thank you so much for joining us at More Than Words! Absolutley beautiful background... Thank you for joining us at More Than Words... :)HUGS!